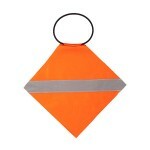 Green Triangle Distributors supplies site and road safety flags for construction and roadwork as well as schools, communities and commercial businesses. 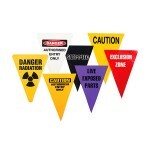 Our range includes handheld flags and heavy-duty bunting. For optimal visibility, we have flags in neon red, orange and yellow including two coloured flags and flags with reflective tape. With the quality of our products, you get a quick and economical solution to signaling to drivers and highlighting possible risks in a site. 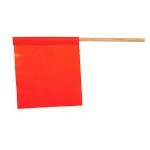 The handheld flags are long-lasting while the bunting can be relocated for reuse. 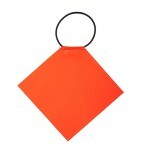 View our range of site and traffic safety flags today or contact us for enquiries. 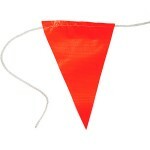 Red and White Bunting Red and White Bunting attached to heavy duty rope, these Red and White triangular flags are ideal for zoning off specific areas within work sites and are easily attachable to p.. Attached to heavy duty rope, these triangular flags that are ideal for zoning off specific areas within work sites or at functions and are easily attachable to posts or poles. Featur.. 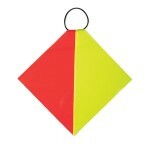 Features: PVC Vinyl Heavy Duty warning flag Easy Shock Cord tie-off Handle Size: 300 or 450mm Made in Australia .. Features: PVC Vinyl Heavy Duty warning flag 50mm Reflective Tape Easy Shock Cord tie-off Handle Size: 300 or 450mm Made in Australia .. Features: Handheld flag with 16mm Hardwood Dowell handle Fabric: Cotton, Polyester or PVC Vinyl Heavy Duty Size: 300 or 450mm Made in Australia .. 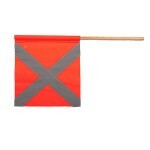 Features: Handheld flag with 16mm Hardwood Dowell handle 50mm Reflective Tape Fabric: Cotton, Polyester or PVC Vinyl Heavy Duty Size: 300 or 450mm Made in Australia .. 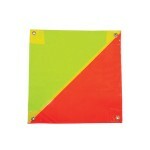 Features: Heavy Duty warning flag Metal Eyelets on each corner Colour: Yellow and Red Fabric: 100% PVC Fluorescent Vinyl or 100% Polyester Fluorescent Fabric Flag Size: 300 or 450mm M.. 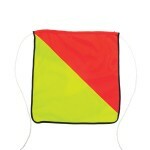 Features: Heavy Duty warning flag Reusable hi-strength 4mm nylon rope with 2 meter length for easy tie-off Colour: Yellow and Red Fabric: 100% Polyester Fluorescent Fabric Flag Size: 3.. 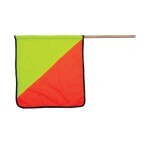 Features: Handheld flag with 16mm Hardwood Dowell handle Colour: Yellow and Red Fabric: Cotton, Polyester or PVC Vinyl Heavy Duty Size: 300 or 450mm Made in Australia .. Features: PVC Vinyl Heavy Duty warning flag Easy Shock Cord tie-off Handle Colour: Yellow and Red Size: 300 or 450mm Made in Australia ..